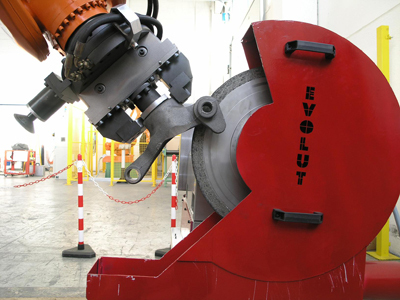 Evolut foundry applications: Aluminium, cast-iron casting and core fettling, gravity chilling, robotised cells for o sandblasting process, core assembling cells. Each process can be managed through Hawk++ vision systems which are able to identify and detect different kinds of objects thanks to sophisticated research algorisms, to identify their positions, angular orientations and to check burr presence. In this last case, used for fettling processes, the vision system interacts with the robot modifying its path and its velocities according to the burr itself. Another Evolut know-how in fettling processes is the 3D programming system.The vision system and 3D programming combination create high flexibility in cells and guarantee a dramatic reduction in cell standstills during production changes. Evolut is going the globalization way. The first after-sale centres have been opened in Germany and Spain. 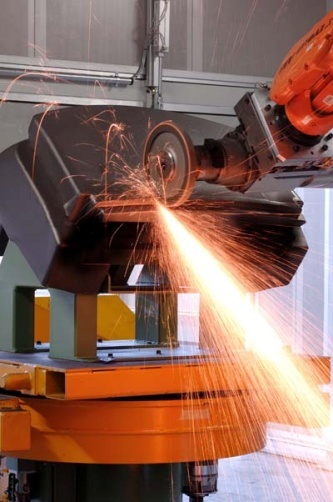 Service for Mechanic Industry and Metal Working (transfer and machining center loading/unloading) with mechanical stocks. Flexible plants with visions systems.